Shelley's Nook is a newly renovated, immaculately presented, bright ground floor apartment. Shelley's Nook is well-equipped with everything you will need to make the most of your holiday and is conveniently located within an easy stroll of the wide beaches of Sheringham and the town centre but is tucked away from the hustle and bustle of this busy seaside town. It boasts an allocated parking space and a small enclosed garden; ideal for relaxing and enjoying those hot summer evenings!Ground floor: Front door leading into open plan lounge/kitchen/diner: Lounge: with smart TV. Double Sofa. Kitchen: Electric hob and electric oven, microwave, built in fridge/freezer. Door leading into double bedroom with smart TV. En-suite Bathroom: with shower cubicle, WC and wash basin, electric towel rail. Please note: Enclosed small patio. Wi-fi. Location: beach 320m metres, pubs and shops a 5-minute stroll. Strictly NO pets are permitted at the property or to visit. Bed linen and towels supplied.Please note that the information on this page is intended as a guide only. We cannot accept responsibility for any inaccurate, misleading or incomplete information about any property and its facilities or services. All properties are non smoking. Shelley's Nook is a newly renovated, immaculately presented, bright ground floor apartment. 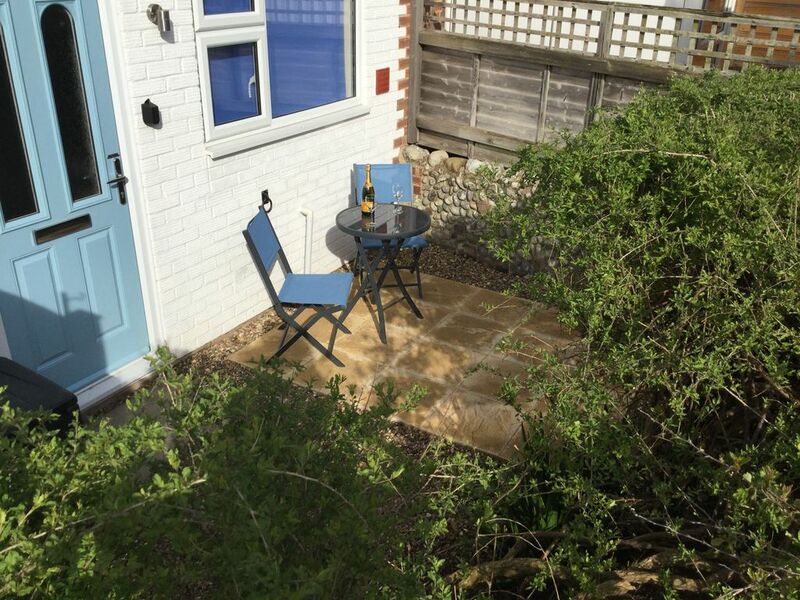 Shelley's Nook is well-equipped with everything you will need to make the most of your holiday and is conveniently located within an easy stroll of the wide beaches of Sheringham and the town centre but is tucked away from the hustle and bustle of this busy seaside town. It boasts an allocated parking space and a small enclosed garden; ideal for relaxing and enjoying those hot summer evenings! The flat is bright, spacious, well furnished, comfortable and well equipped. We cooked our Christmas dinner easily as the kitchen is well equipped. Just a suggestion - please provide a shower mat, the tray does get a little slippery. Very easy access to the town and sea too. Thank you for your review, I am pleased you had a lovely Christmas and found the apartment immaculately presented. I will address the issue of the shower mat and hope to welcome you back soon. Whilst the overall size and layout of the flat were superb, there were a couple of issues. The single path to door impeded your progress with a suitcase, and, in our case, my husband’s scooter. The bed was very hard and high, and some things were out of reach for us, 70+ people do not stand on stools to reach things. The water was not hot enough. All of these things only need minor tweaking and then the apartment would get an ‘excellent’ rating. I don't usually bother with reviews but liked this place so much. We visited Sheringham for the first time last year on a damp and miserable bank holiday. Walked up and down the High Street, caught the train and left. Fast forward a year and we love the place. Why? It's a great old fashioned seaside town, real family feel to the place, nice people. But that's not the only reason we love the place, we found great accommodation. With only a few weeks left until the whitsun holiday we hadn't booked anywhere ( been a busy year) and we thought there must be more to Sheringham, ok ok we couldn't find anywhere in Cromer 🙄. We like the freedom of self catering and had used HomeAway before. We searched and found this place. Looked ok, satisfied all requirements. Booked it. The place was spotless. Good quality everywhere. Perfect for a couple. This place has everything you'll need, real home from home. Location is excellent, few minutes walk and your in the heart of Sheringham, nice pubs and restaurants, but this place is in a quiet residential street. The information pack is a mini tourist info centre. It has everything, including info on some great walks, only managed 2 but already planning for next year. Bathroom excellent size, good shower. Bedroom big with excellent quality furniture and comfortable bed. Living room/kitchen was perfect. Just one improvement would be to upgrade the sofa to a sofa bed. This place is a credit to the owners who have made a real effort to please. We are so pleased that you enjoyed your stay at Shelley's Nook and look forward to welcoming you back to Sheringham in the future.